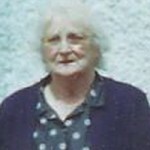 The death took place at the weekend of Nonie Laffey of Lackagh. Nonie and her husband Willie moved to Lackagh in the early sixties from Currandulla where they had lived after they were married. 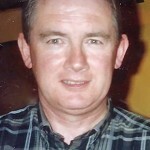 Nonie who was a member of the Delaney family of Monard, and was hugely popular in the area. Nonie went to Birmingham with her sister Nellie who passed away last February, in her youth and they both worked on the buses in Birmingham. However Nonie who had also started nursing training was brought home to care for her father in Monard. Her gentle unassuming personality always had a warm welcome for all. Around Lackagh over many years, Nonie was always on hand to help out with anything and was involved in all that was good in the parish. Nonie was a member of the ICA and Apostolic Work Society and could be found helping out in the tea room of Lackagh Museum when required. Nonie had an extended family of children as she cared for other children after her own family were reared. 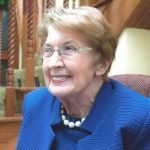 Nonie was always a wonderful friend to many and was much loved and respected within the community at Lackagh. A wonderful family person Nonie always gave much of her time to her immediate and extended family. She will be sadly missed by many and will be fondly remembered in the area. The remains of Nonie Laffey reposed at Lackagh Mortuary Chapel and were removed to the Church of Our Lady of Knock, Lackagh for her Funeral Mass where her long time neighbour Fr Gussie O’Brien was chief celebrant and was joined by Fr Joe O’Brien, PP Abbeyknockmoy and Fr Barry Curran, after which burial took place in Lackagh Cemetery. Nonie is survived by her husband Willie, sons Tom and Gerry, daughters, Mary, Pauline and Anne, sisters Julia and Margaret, brother Paddy, daughters in-laws, son in law, sisters in law, grandchildren, relatives, neighbours and friends.